As a profession, statistics show we are a cynical and thin-skinned bunch. As such we look at coaches with a generous dose of doubt, married with an abject fear of the constructive criticism that will surely result. Undaunted, Gary approaches these lawyer biases and fears personally, positively, professionally, and politely with determination. He becomes your alter ego, the constant voice in your ear, coaxing you along a road that you know you should travel… Partner with Gary if you want to get to your destination in less time and with less effort. I can say this counting Gary as a partner for over 10 years, in various capacities and successful pursuits. Gary is no nonsense with clear, reasonable and attainable approaches to help you realize your vision and goals. With a good start under my belt, I realized I needed guidance on a path forward in my career and to partnership. Coaching helped me focus on longer-term goals. Gary acted as a third party (no judgement) sounding board for ideas and provided the accountability to keep me motivated to do the things I knew I should be doing. Young lawyers need to actively think and act early on to structure a sustainable practice that can align life and career goals. Coaching can give you that external push and perspective to get there faster. Several years ago when I was a non-equity partner in our Toronto office I worked with Gary Mitchell in his Business Development coaching program. Working with Gary helped me change my mindset around business development and the results followed. I am now our firm’s Office Management Partner in Calgary. The BD coaching certainly helped to put me on a path to building my practice and succeeding as a leader. Thanks Gary! I met Gary Mitchell at a time of crossroads in my legal practice. After ten years I had achieved “success”: partnership, loyal clients and a reasonable pay-cheque at a downtown Vancouver law firm. However, I held an ambition to grow my practice further into something special. Misguided attempts on my own or guided by legal marketing “experts” had led only to frustration. So I conducted my own search for an individual that had the aptitude, skills and mindset I needed to get me on track. After interviewing a number of candidates, I chose Gary. There is no doubt he was the right choice. Gary’s approach to business plan development helped me to focus and tailor my business development efforts to my appropriate market. I appreciated that he brought to his work a nuanced understanding and experience of different legal practice areas and the unique circumstances each area faces when it comes to marketing and business development. Gary’s program really delivers. I was skeptical of working with a coach, but armed with Gary’s skillful application of practical business principles to my own practice, I am now focused, experiencing great results, and excited about the future. I have recommended Gary’s program to numerous colleagues. Gary provides practical and concrete steps to business development. I’m a big fan of both Gary and his program. Working with Gary has led to more business in less than 3 months. I’ve known Gary for some time and have been working with him for the past four months. I’ve been very happy with the results in a short period of time. Gary has helped me identify how to become more productive with my time, identified areas where my marketing efforts were not getting the results they should, has offered some excellent strategies that are a better use of my time and resources, and we are already planning for the growth of my firm including: hiring, compensation, budgeting for success and so on. If you are looking to grow or expand your business, I highly recommend you have a conversation with Gary to see how he can help you. Gary is positive, motivating and action oriented. He provided me with invaluable insights and the focus to drive my goals forward. Gary assisted me greatly a few years ago developing a business plan for me in my law practice. I encourage everyone to see a proper manager or coach to help them see the “light”. Thanks Gary! Gary provided motivation, inspiration and accountability as I started to focus on business development as an important part of my practice. Gary’s method creates results, is easy to follow, and is unique to the legal profession. 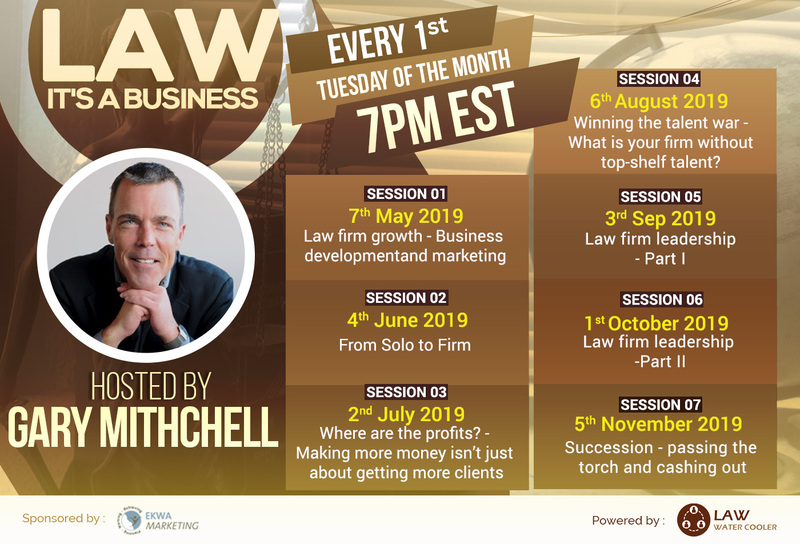 Gary’s focused business development strategies are a significant improvement over the general scattered strategy that I see most lawyers implementing. If you’re serious about focusing on the next stage of your career, you should get in touch with Gary. Gary is a superb individual. I know Gary from his work assisting lawyers; partners and associates alike, in developing themselves as individuals with a view to increasing their client base and ultimately realizable production. The results are invariably more profits, in less time and with less expense – for both the lawyer and the law firm. I had the pleasure of working with Gary Mitchell as my Business Development coach for one year. Gary has truly been monumental in my career as a Senior Law Clerk at Benmor‎ Family Law Group. Gary’s integrity in this process, expertise and ability to think outside the box, has made my journey in business development rewarding and successful. My business plan and goals that I had developed with Gary have now come to fruition. This includes being a presenter, being a board member for a not for profit organization, being actively involved in various organizations, publishing and being present in social media. Gary has taught me the importance of focusing on personal and professional growth. He also taught me that we should be proud of our accomplishments (whether big or small). For example, over the course of the year working with Gary, more referrals began coming to me and my billable hours increased by 20 percent at the same time as being actively involved with business development. I can’t say enough about how my working with Gary has put me on a career path I couldn’t have imagined a short time ago. I highly recommend him. Gary is a personable, dynamic and insightful client development coach. From helping develop a business development plan through to on-the-ground practical advice, Gary customizes his programme to suit particular needs. I highly recommend Gary. Gary makes client development a painless – dare I say enjoyable – process. Unlike others who use a ‘one size fits all’ method, Gary works with you to find an approach that is consistent with your own personal strengths, temperament, and values. Gary is down-to-earth and affable, and he is a genuine pleasure to work with. I happily recommend him.